Targeted MP3 Recordings. Enjoy Radio Stations, Music & Podcasts Anywhere. Audials Radiotracker uses its one-of-a-kind technology to fulfill all your music requests completely automatically and legally. 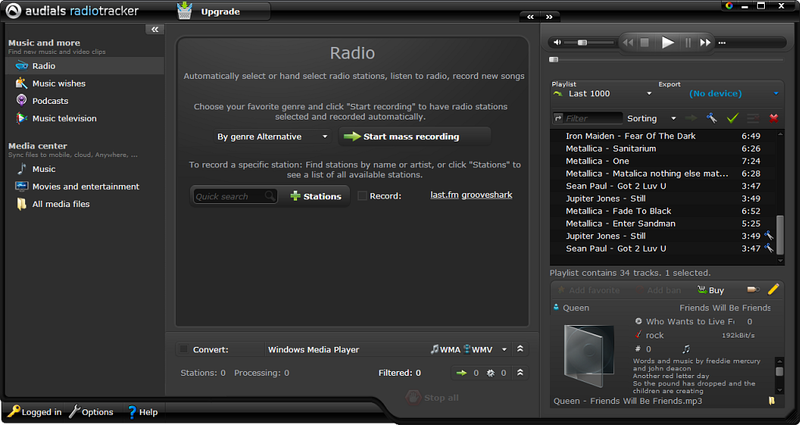 Only Audials Radiotracker can monitor thousands of radio stations simultaneously to get your desired music. Just choose a title, artist, album, genre or radio station and hit start. Audials Radiotracker uses the Audials Network to simultaneously monitor thousands of radio stations online to quickly locate specific radio stations and then automatically records your desired music. Audials Radiotracker starts recording when the song starts and ends when it stops to remove radio talk and commercials. Then the track is automatically recorded at a uniform volume. Audials completely automatically rounds off your media collection with ID3 tags, album covers and lyrics. The organizer lets you easily manage and organize even the largest of music collections. The Audio-Studio lets your edit your files post-recording. The ringtone generator gives you your favorite songs as a ringtone on your cell in just three easy steps. There are more than 25 music TV stations in your player via live stream. Audials Radiotracker has tens of thousands of the best audio and video podcasts in the podcast directory to give you the very best entertainment around. No matter where you are or which device you use - Audials hooks you up w/ the best entertainment. By using your smartphone or any internet-capable device Audials lets you enjoy your media anywhere straight from the clouds.